Just a year ago I was making final preparations for a dream trip to London, England. The "Tea in London" tour was led by an online tea friend, Denise LeCroy at http://www.teainlondon.com/ I have so many fabulous memories of that trip. 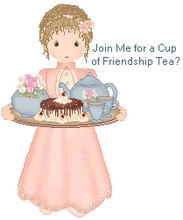 We were a group eleven ladies with a common interest in tea who became good friends. The March 3 - 10, 2007, trip to London was one of the best things I have ever done for myself. I appreciate my family for making it possible for me to go! Believe it or not, I actually purchased the fun "made in England" teapot in the photo above a few years ago at a yard sale in London, KY, a little less than an hours drive from here. Last year when I told local folks I was going to London for "tea" I got several funny remarks like "I didn't know there was a place in London (meaning KY) to have tea!" I will be reminiscing about my special trip over the next few days and showing photos of some of the best places in London (England) to enjoy tea! 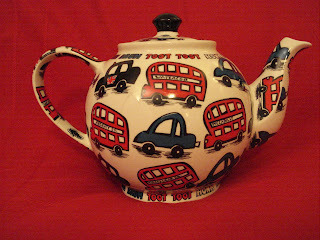 I enjoyed your story about the London teapot and London, KY. I look forward to reading about your tea times in London, England. My tea memories from there are among my favorite. I would love to visit England one day...especially to go to Princess Diana's grave site...I understand you can't get too close but you can see where she is buried. My sister lived there for 3 years and got to visit the grave site. What a neat little teapot!